Living in a radiant heat home provides you with a level of comfort that no other heating method can match. So, how do you combine this luxury with valuable hardwood floor? Is the combination of radiant floor heating and hardwood floor a dream or nightmare? The most important factor in a successful wood flooring installation over radiant heat is a dry slab and a dry sub-floor. The only sure way to dry a slab and subfloor is to turn on the radiant heating system before installing the wood flooring. If this isn’t done, moisture left in the concrete will enter the wood flooring as soon as the heat is turned on. The result is flooring that will expand, contract, shrink, crack, cup and bow excessively. If the heat can’t be turned on, then everyone involved down to the homeowner should understand and accept the consequences that will appear down the road. Opinions on the amount of time required vary widely. Some say the heating system should be turned on at least 72 hours before installation, with a preferred time of five to six days. That assumes that the slab has been in place for at least 60 days. If the slab is relatively new, the recommendation is to have the heating system turned on for 30 to 60 days before installing wood floors. As always, follow the recommendations of your wood flooring manufacturer. Wood dries rapidly when the heat is first turned on. It dries to a lower moisture content toward the end of the heating season. When the radiant heat is turned off, moisture once again starts to seep into the wood subfloor and radiant slab. Abruptly turning on the radiant heat in the fall will subject wood flooring to rapid and easily noticed movement: Evidence of this change will be cupping or crowning of the boards. Finally, shrinkage cracks will appear between individual floor boards. Alternatively, gradually turning the heat on before the first cool day will begin the seasonal movement more gradually. Thus, the movement of the floor will be much less noticeable. As always, humidity controls can help offset flooring expansion and contraction. Not all species of wood are suitable candidates for an installation over radiant heating. It’s best to follow the manufacturer’s recommendation for a species’ suitability over radiant heat. When possible, choose a species that is known for its stability. Quarter-sawn or rift-sawn flooring is preferable to plain-sawn in the search for stability. Strip flooring is also a better choice than plank flooring because narrow boards expand and contract less than wide boards do. Using narrow boards also means there are more seams in a floor to take up movement. Because of its dimensional stability, laminated flooring is another good choice. • Laminated/Engineered Wood Flooring: it is more dimensionally stable than solid wood flooring. • Floating Floors, Laminated/Engineered or Solid: tend to move as a unit to help accommodate moisture content changes. • Certain Species are known for their inherent dimensional stability such as American Cherry, American Walnut, Mesquite, Teak, and others. Other species such as Maple and Brazilian Cherry are unstable. • Quarter-sawn or Rift Sawn Wood Flooring are more dimensionally stable than Plain Sawn wood flooring. Narrow boards- (2Â¼”-56.7mm or less) are the best choice of solid wood flooring over radiant heat. Before you start, see manufacturers of wood floor products suitable for radiant heat! To minimize the effect that rapid changes in temperature will have on the floor, it is recommended that an outside thermostat is installed. If one is not present, suggest to your customer that this should be considered. 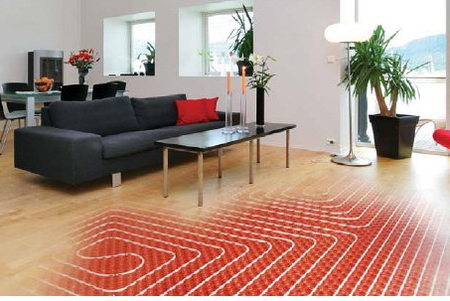 Unlike conventional heating systems whereby when it becomes cold, the heat is switched on, the radiant systems work most effectively and with less trauma to the wood floor if the heating process is gradual, based on small increment increases in relation to the outside temperature. Sub-floor should have proper moisture tests according to standards in the trade. A 6-8 mil polyethylene vapour barrier should be installed over slab radiant heat systems. Tape all seams to be sure the barrier is tight. To protect the barrier from rips, some contractors lay 1/16″ (1.5625mm) thick foam sheeting over the vapour barrier. When the slab has cured, turn the heat on regardless of the season and leave it on for at least 5-6 days before installation of the wood flooring.